Even before I write this post, my colleague Gustavo Arellano has me beat. He's found 50-cent tacos at El Bukanas in Santa Ana. So if you've already jumped at that tip, you might as well stop reading here. You'll have to pay twice that for the tacos I'm about to write about, at Taco Mesa's Taco Tuesday. And of course, the deal's only available one evening a week. Besides that, the Taco Tuesday at Taco Mesa isn't news. The fact is that this Orange County-born chain has been doing it for ages like all other taco joints who have used the catchy alliteration to their advantage*. The term is a taco purveyor's gold mine. Think about it: Are there any other foods that has a day of the week so readily associated to it? If "Manicotti Mondays" or "Weiner Wednesdays" has been coined, it hasn't caught on. So while I wait for some enterprising restaurant industry marketer to introduce "Sushi Saturdays" into the lexicon, the crowd of people I encountered at the Orange branch of the chain knew exactly what they were there for: dollar tacos and all the free escabeche they can eat. The latter has always been the one thing that I loved about the Taco Mesa and Taco Rosa chain -- razor wire-sharp, explosively colorful, and the best application of cauliflower that I've ever seen. Taco fillings range from chicken, to al pastor, to shredded beef. Patrons range from Chapman University hipsters, to other bargain-hunting non-cooks like myself. Chicken tacos are wrapped in two kinds of colored tortilla and taste half-way between a deep-fried tacos dorado and one that uses comal-warmed tortillas. I can't tell which one it is, but I can tell you that they're greasy, slightly crunchy, and sprinkled with the mild feta tang of crumbled queso fresco. It's that grease that fills you up. The al pastor is lean, well-seasoned, tinged to an angry shade of red. And in it I found something I've never found in an al pastor: tiny cubes of pineapple. I loved its addition. Fruit, especially acidic ones like apples and pineapples, always work well with pork, and it's especially welcome in these tacos. However, I cannot say that it is the best al pastor that I've ever had. That title still belongs to the al pastors sold by a Bellflower hole-in-the-wall called Tacos Jalisco #2, which, to my knowledge, does not offer a Taco Tuesday. *For more Taco Tuesday deals, check out my buddy Christian's blog post here. I just wrote in Gustavo's post in "stick a fork in it" (or whatever its called) about how you two both need to go back to Carnitas Los Reyes and order the CARNITAS. Both of you guys have been screweing around in that place ordering everything except what they feature in their NAME! Taco Mesa never impressed me. Kinda bland. And in S. Cal, we don't need to settle for bland Mexican Food. Good Tacos are as prolific as D cups out here! mmmm, queso fresco. I didn't realized Taco Mesa did the Taco Tuesday thing. do you know if they have it at all their locations (or at the Taco Rosa's), or just in Orange? being at UCI, their Costa Mesa joint is much closer, as is the Taco Rosa off of Bonita Canyon. I'd love to hit them up some evening for that wonderfully alliterative event, but the haul out to Orange makes the prospect slightly less enticing than if it were closer. Gustavo doesn't like carnitas. And me? Well I've tried to get it at Los Reyes. Twice. Everytime they say that they just ran out. Guess that means it's good. I end up with the chorizo...one usually does me in. That red oil that oozes out is like an unholy, but delicious sauce onto itself. They do, in fact, have the Taco Tuesday specials at all Taco Mesas (not sure about the Taco Rosas). And actually, I left something out of the review: They also do a Taco THURSDAY too! Except they only do fish tacos then. The regular ones I mentioned are full price. I wish I had the talent and the time to make chicken tacos. When I do usually make tacos, it's starts by me ripping open an envelope with the name "Lawry's" in the front. yes, the Costa Mesa location is the perfect prelude to an evening at the Goat Hill (if that's your sort of scene). My favorite thing at Taco Mesa are the blackened chicken tacos. Is there any difference with the Taco's Jalisco in Orange on Tustin and Walnut to the one in Bellflower? Mrs. DanGarion and myself will soon be living 1/4 of a mile from it. Oh and I've had the carnitas as Carnitas Los Reyes and I still think the carnitas at Azteca in GG is still better. You're pictures are awesome! The taco shells appear to be "puffy." Is that the case? If so, you've saved me a trip to San Antonio, TX for the famous puffy tacos (as featured on Bobbly Flay's Throwdown on the Food Network. Thanks! @Anonymous: Those aren't puffy tacos at Taco Mesa. But you still don't have to go to San Antonio for puffy tacos, Arturo's in Whittier has been serving those up for years. They don't appear to have a site, so here is a link to their Yelp.com reviews. I haven't them a couple times, they are pretty good. 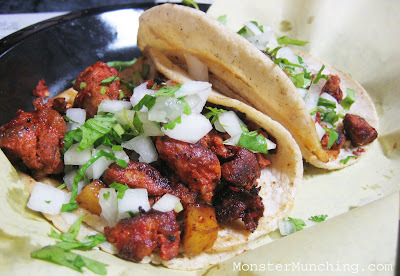 I've been to the taco mesa in Costa Mesa a couple of times, and I've always talked myself out of trying the al pastor there, I'm not sure if I remember anything about pineapples though. It definitely sounds like a great combo though. OHHH I live right there and I love Taco Mesa and their Taco Tuesdays! Its not the best but its still a tummy pleaser. On the flip side, I need to try that TK Burger, to get the breakfast you chronicled in your post. The more dollar tacos to absorb the booze the better I presume! I think they are related, but I've been only to the Bellflower location, and in that one, I see a Mexican grandma-type doing the cooking. And man can she cook! On weekends, she does an awesome menudo. What you do is you just show up with your own pot, tupperware, or whatever. Then they just fill 'er up! Or if you just want a typical portion to go, they also have styrofoam containers. You can also get a bowl and slurp your tripe soup there, on the spot! I should do a proper review of them one of these days! Just as good a combo as lumpia shanghai and banana ketchup! And Datu Puti vinegar with everything. Yes, certainly not the best (and probably not the best for you either), but a bargain is a bargain, and a tasty meal is a tasty meal. All the Taco Mesas have a Taco Tuesday deal. Elmo linked to my Taco Tuesday entry which is attempting to include all Taco Tuesday-related info in it. On the Reyes note - I just left a comment on "Stick" about trying it this past Saturday. I too had gone once before E, and they were out of carnitas. So I left empty-handed. This second time I got carnitas, chorizo and barbacoa. AWESOME. When I do usually make tacos, it's starts by me ripping open an envelope with the name "Lawry's" in the front. I agree about the cauliflower. But I am not very familiar with the tacos at Mesa, only Rosa and we do like those. Very much. 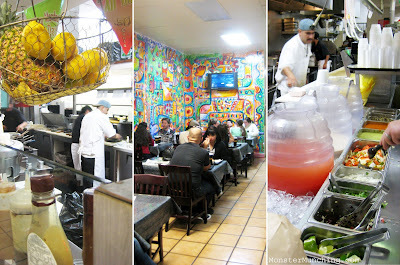 The tacos at Taco Mesa and Taco Rosa are very similar. One of the managers told me once that they tend to spice things up a bit more at Mesa. Hmm, interesting, I love Monster Munching Mondays (which is when I read the newly updated Monster Munching), and unfortunately, we don't have Taco Tuesday up here in San Francisco. Yep. I think I like the Mesa over the Rosa. Cheaper and no tip required. And amen on Reyes' barbacoa. I remember that to be very good as well. Touche! It *is* Monster Munching Monday for those who read this blog! For me, though, it's Suffering Sunday to write the post! HAHA! WHO HAS THE BEST TACO TUESDAYS??!! Would love to hear from the readers. Did your buddy said it was any good? It may be cheap, but it still has to be good. Wow, the two color taco tortillas are very cool looking, but I wondered if they added any other flavors to that. By the way, Taco Jalisco? I know the place! It's next door to an Indonesian place called Toko Rame which is one of the few Indonesian place I really like in this area. Taco Jalisco? Wow, I'll check it out for that Al Pastor. Thanks for the tip! I like Del Taco's Taco Tuesday, but I liked them even better when they were 3 for $0.99. But that's not a complaint. It's still got all 5 essential food groups: meat, cheese, lettuce, shell, hot sauce. Well Gustavo *IS* "The Mexican", so although I haven't tried it myself, I'd trust his palate on Mexican food more than any other bloke...or hombre. Yep, that's the one! Toko Rame is also a favorite of mine. Here's a review I did. I kid. ;) I don't suffer too much. Besides, before I write, it's usually a "Sleepy Sunday". man this post makes me sad.. can't wait to get back to southern cal!!! Aw...don't be sad. These tacos and even cheaper ones abound. All will be waiting for you when you get back! On the flip side, I'd like to eat what you've been eating in Taiwan!